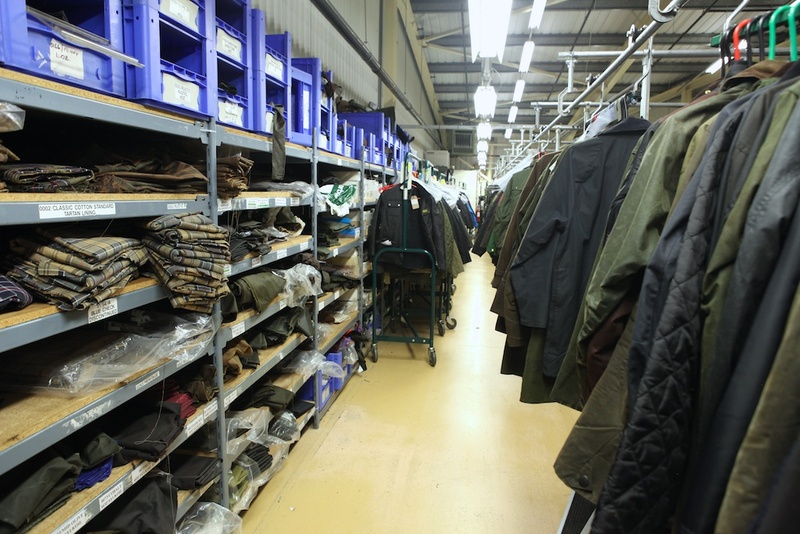 Made in England | J. Barbour and Sons | A Continuous Lean. 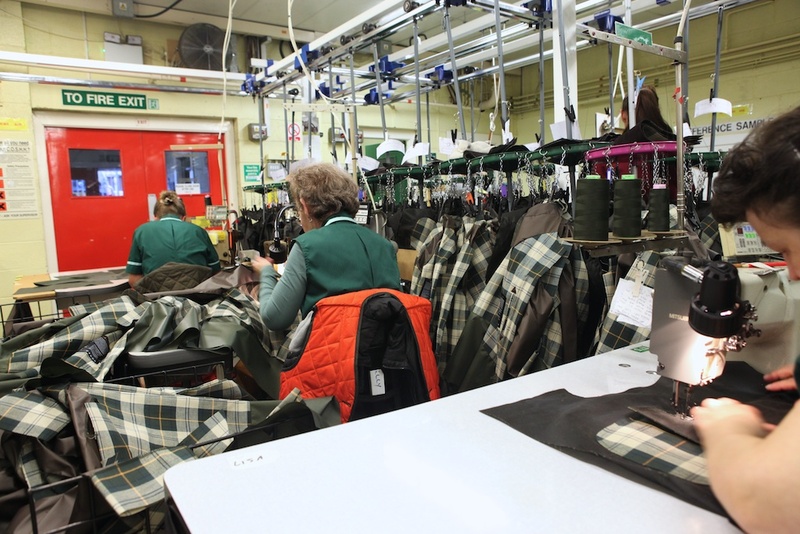 It’s not exactly Barbour season for me, but while my Bedales & Beauforts sleep in my closet waiting for their triumphant return this fall, the factory where they were made hums right along at a fever pitch making great-looking and long-lasting outerwear. 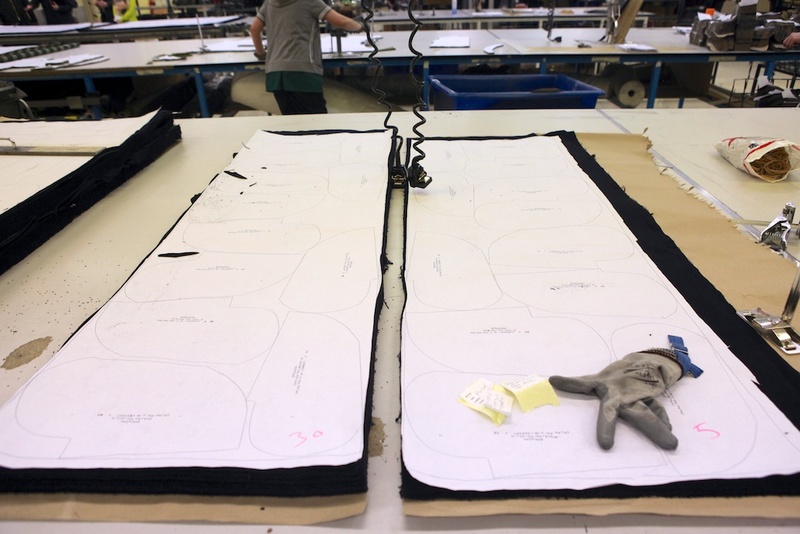 Last summer I was thinking about embarking on a trip around the U.K. visiting the British factories that turn out the classic menswear items that captivate me (like my “Made in Italy” trip). 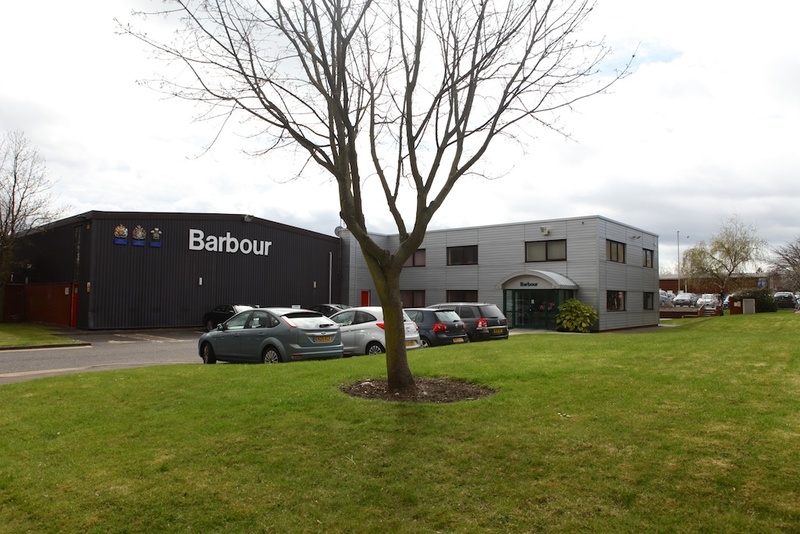 As it turned out, I didn’t end up having the chance to organize the trip –I still might do it, eventually– but I did manage to tour the Sunspel factory last fall, which was my first exposure to â€œmade in England.â€ Recently I was invited as a guest of Barbour to see their factory and home office in South Shields, near Newcastle, England. No brainer. 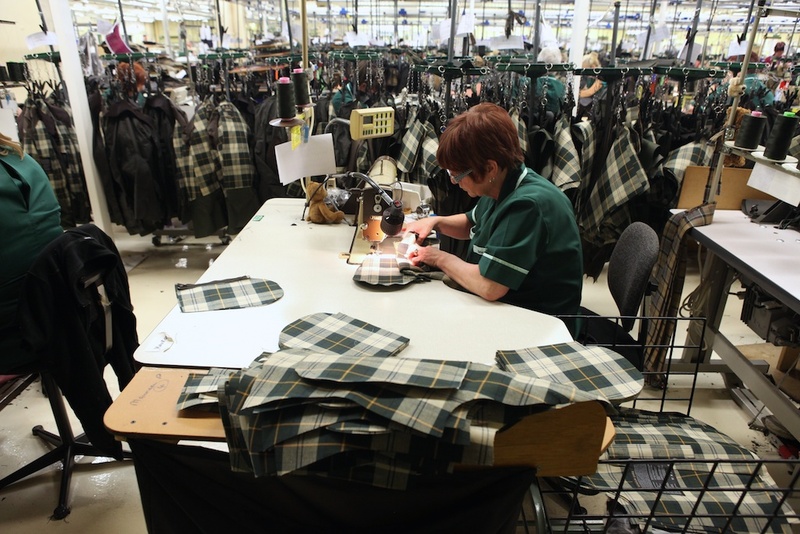 The Barbour Factory was on a much larger scale than I had anticipated. I knew the brand was popular with healthy distribution, but I was not expecting to see so many workers. 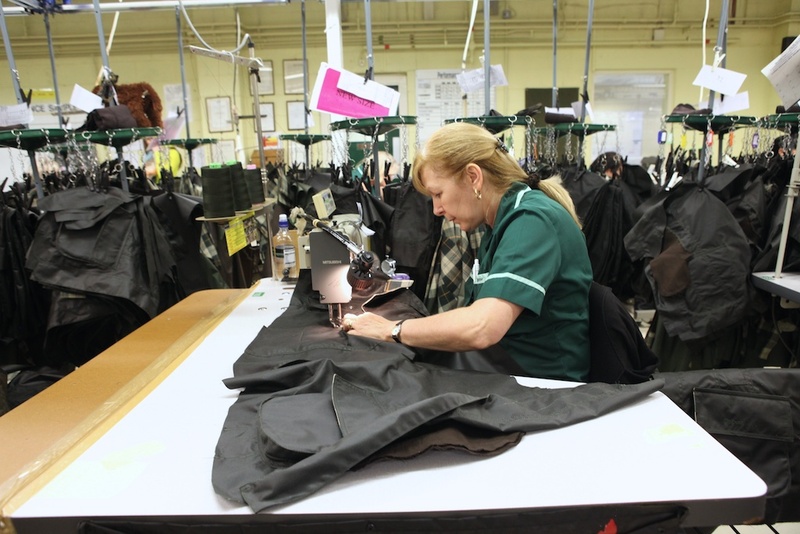 The workforce on the factory floor was almost entirely women –which was also surprising. 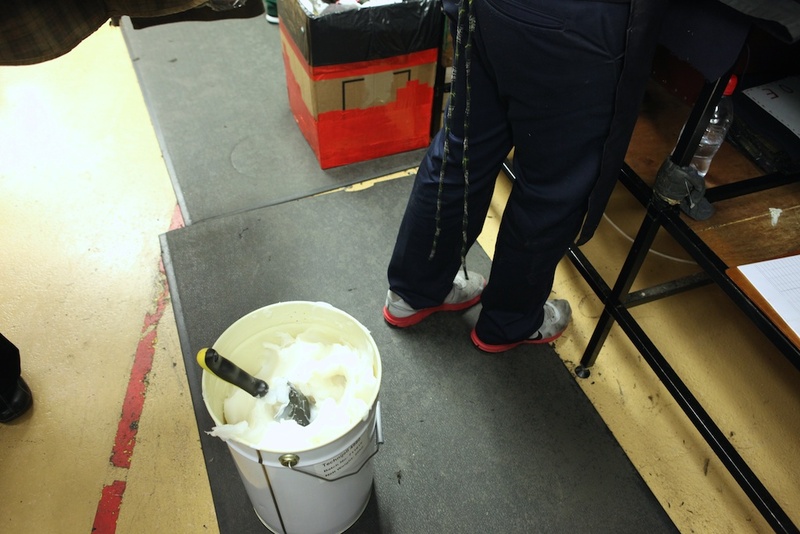 It felt a lot like the Red Wing Shoe Co.’s Plant II in Minnesota, different product all together, but a similar vibe. 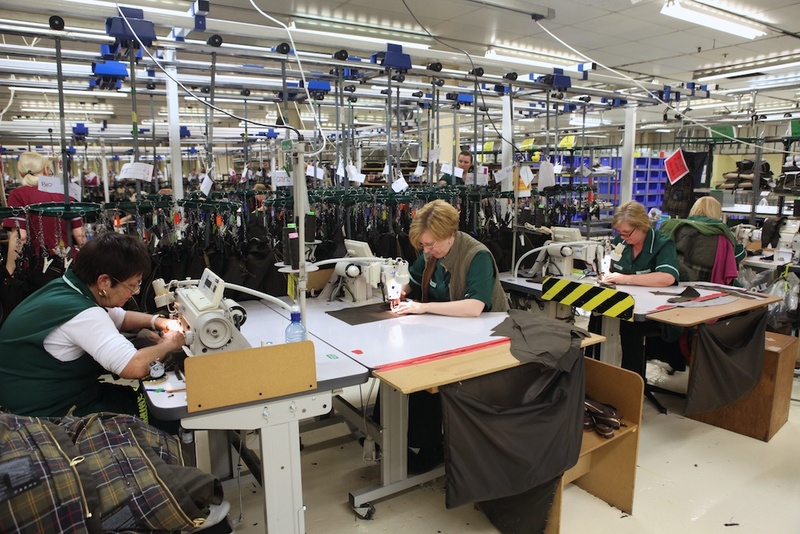 Having worked with Red Wing for the past few years, and there’s a strong similarity in company structure (each is family owned), historical significance, brand loyalty and manufacturing facilities. Walking around Barbour felt just like walking around Red Wing. I had never made the connection before, but it makes sense in hindsight considering the company arrangements and approach. 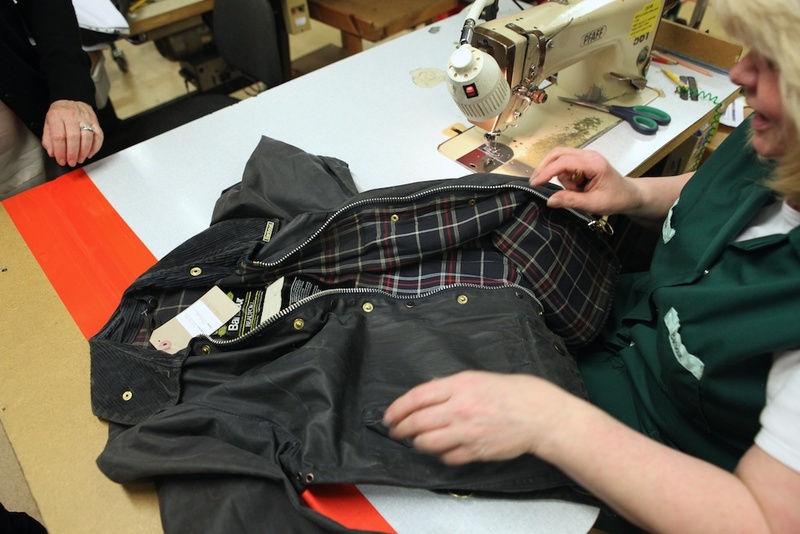 The photos below are from the Barbour repair shop where old jacket go to be reborn as “good as new” jackets. 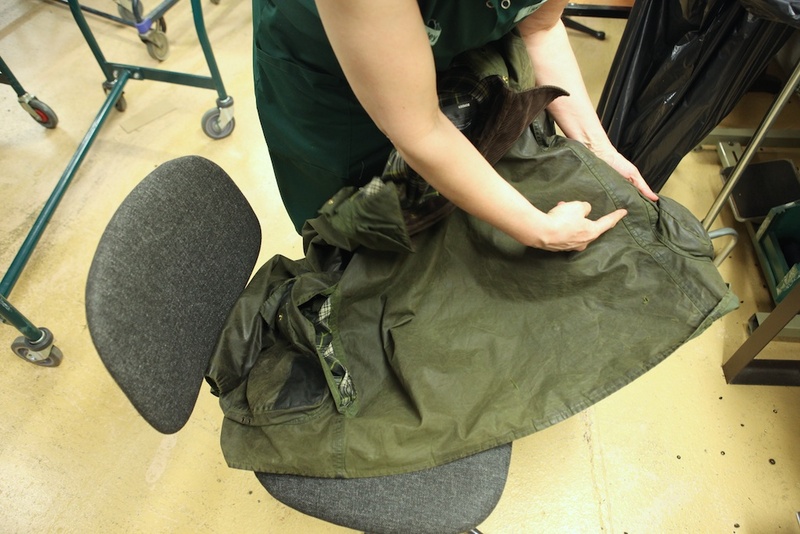 It’s also where my Bedale was repaired on the spot. A ‘Made in England’ tour would be great Michael. Who else would be on your list to visit? I have a grand total of two Barbour garments: a vest (that is, a sleeveless waistcoat!) and a hat, though I don’t think the hat was made in the UK. 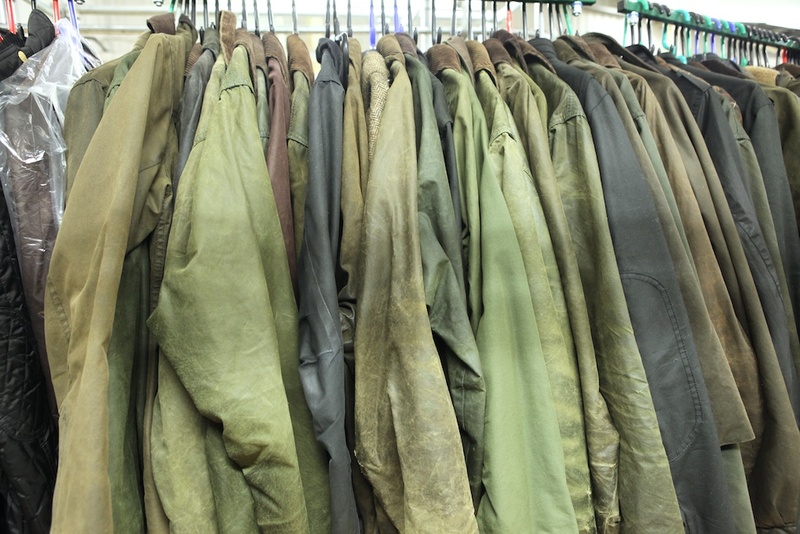 They are, however, a little on the pricey side but somehow I have managed to accumulate a collection of similiar Filson garments, which are equally expensive. 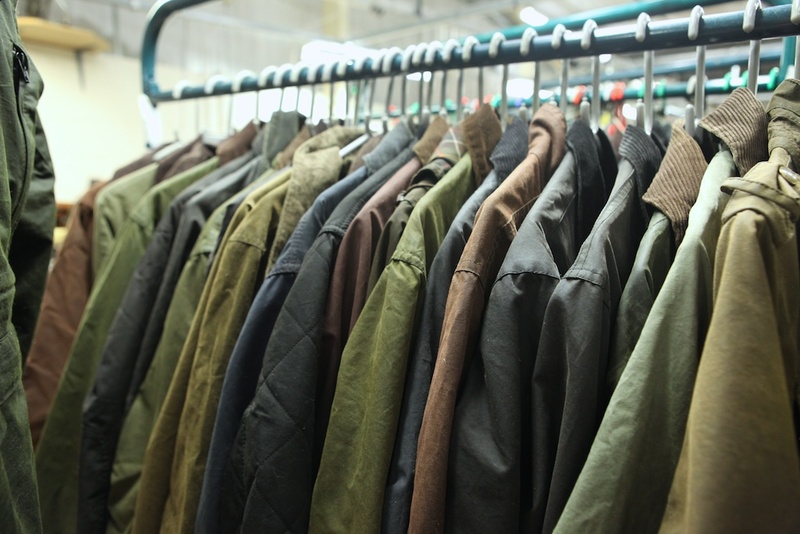 Filson has a different range of garments and offer jackets of heavier materials which were, in theory, intended for working men as well as sportsmen. I’m not saying this to plug Filson so much as I am to encourage you to visit their factory sometime, too. I expect there would be similiarities. 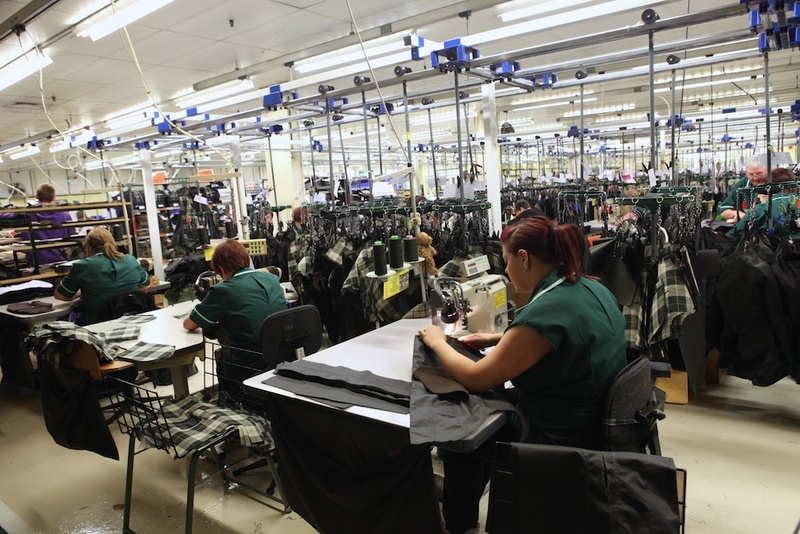 You might note here that among certain segments of the working population (as opposed to the likes of me, who operates a desk) that factory work is in fact, women’s work. Mostly always has been, too. 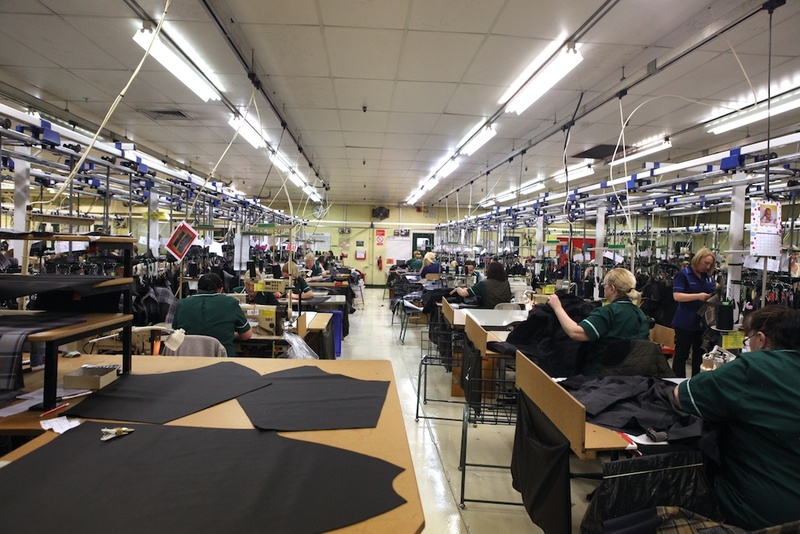 I recently visited the Grenson shoe factory in Northampton, England and I can see the similarities again but this sure is on a much grander scale. It looks like an impressive size, the turn over time must be pretty quick. I think the aim for Grenson was something like 75 pairs a day, as I saw it on the targets blackboard. Friday was a little less, maybe they head off the the pub early? Really great post, I’m glad you made it over and met your heros of sorts. Barbour make nice stuff, but I’ve never purchased anything from them because they always mar their coats with ghetto-friendly logos. I guess that’s chav-friendly in the British context . . .
What happened to America? Are you a damn Red Coat now!? What’s the bucket of white with scoop in it near the end? Let me guess: congealed sheep innards, waiting to be heated and applied to proof the jackets? My old one smells so bad that it has it’s own closet. 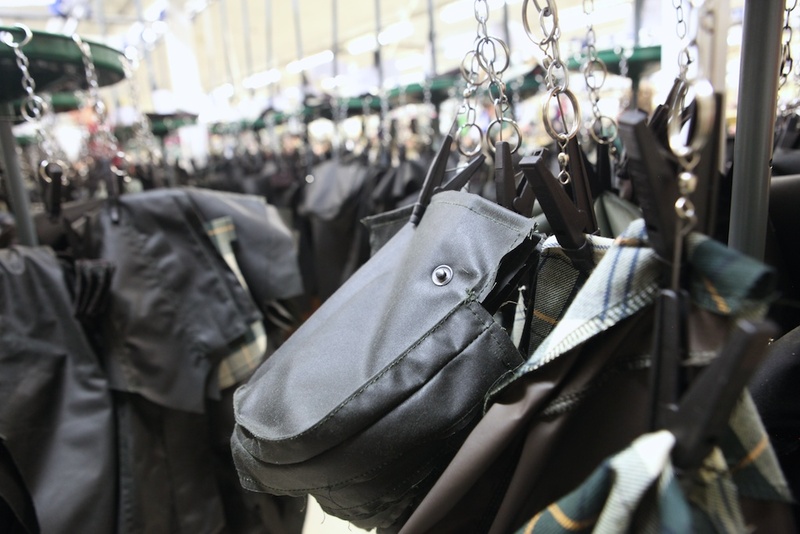 I have to see if Orvis is still holding their Barbour Day and doing reproofingâ€¦maybe that would bring it back to its original smell. Have two Barbour jackets with a third on the way. Quality has been top notch and kept me warm and dry in the grouse woods and in the city. 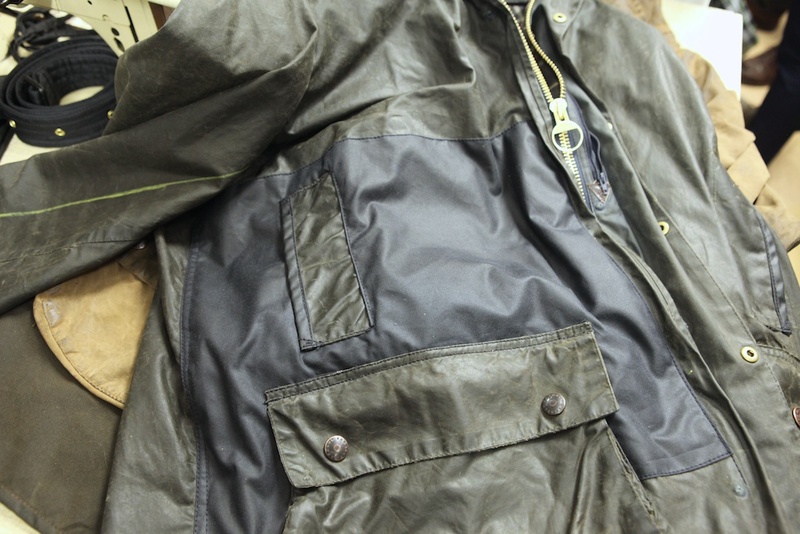 I prefer their older styles – more traditional working jackets than urbanized. As for England, if/when you go plan a stop at Aero Leather. 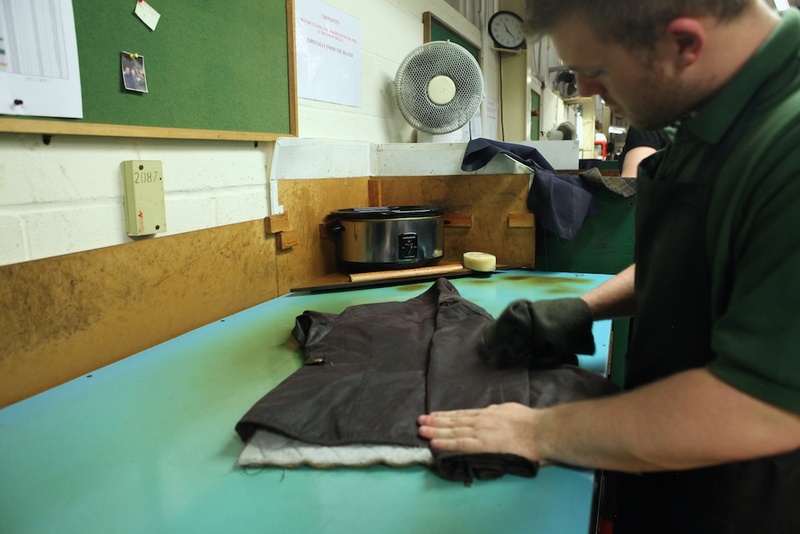 Incredible leather jackets – absolutely top shelf. 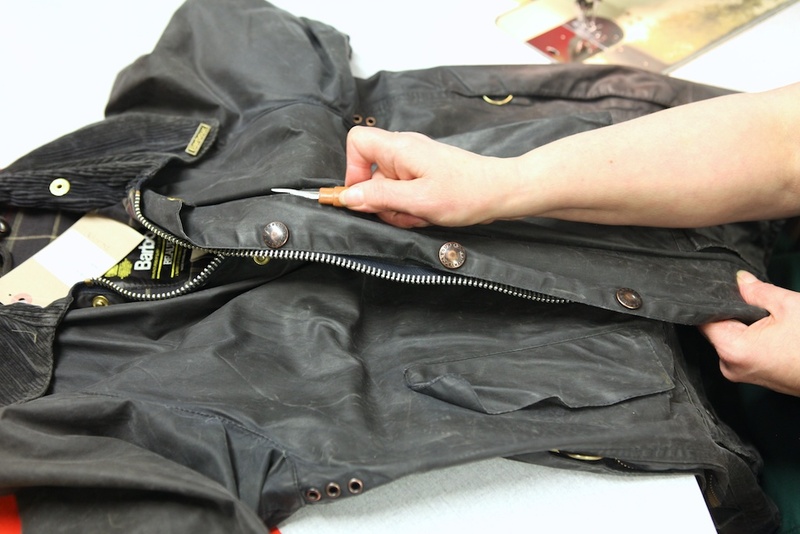 Not “poser” leather’s like those sold by RL, real jackets fully capable of saving one’s life if need be. Logo-ridden, Cameron? Which items? From what I’ve seen, their products are the anti-thesis of logo-ridden. 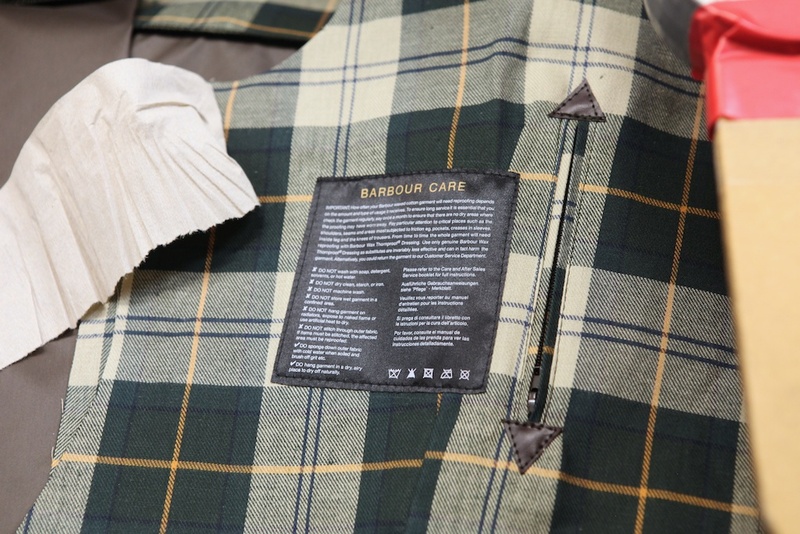 Love Barbour brand…. My only acquisition has been a coat though. It falls in line with my mild obsession with english country brogues, Cheaney Avons being my favorite. 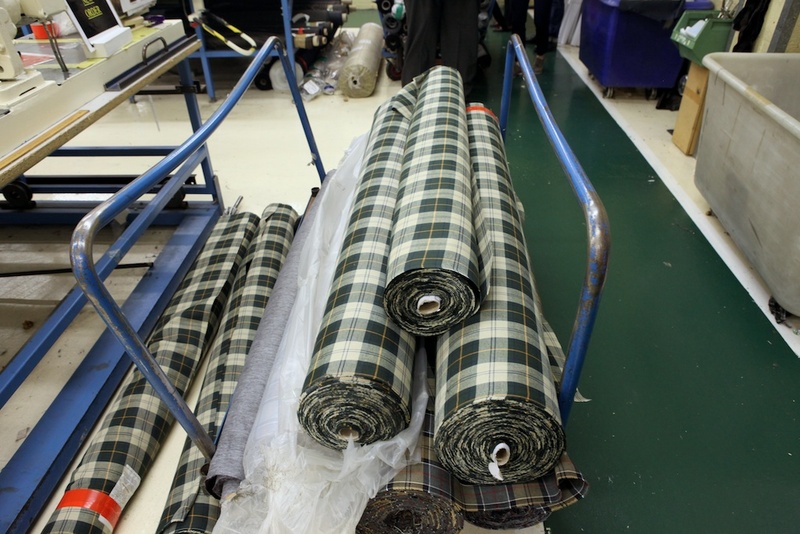 Does anyone, Mr Williams included, know where Barbour’s wovens and knits can be purchased here in the US? I can find jackets and vests with ease but the polos, sweaters and shirts are harder to come by… Anyone have info on online or west coast stockists? 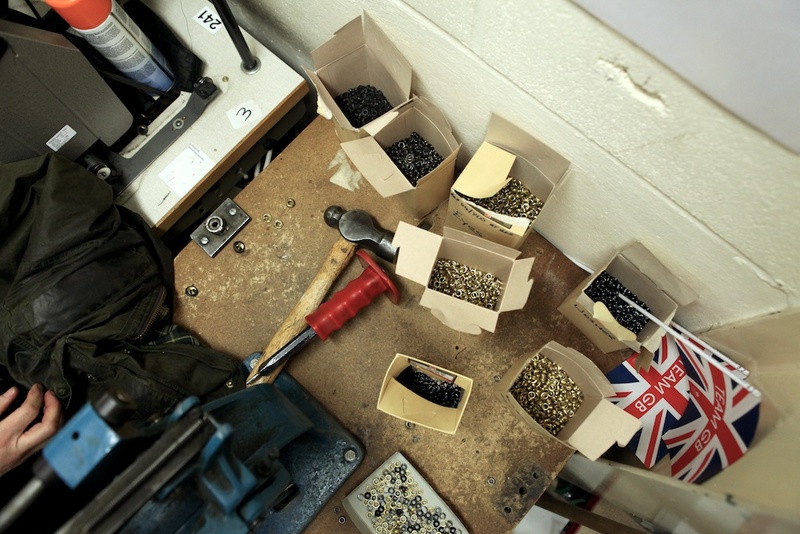 And yeah I’d throw Cheaney, Trickers, Church’s and Loake’s into any “made in england” expedition as they are still quietly building shoes that take everyone sans some Italian cobblers to school. My Border came back from New England Reproofers a few weeks ago, better than new. 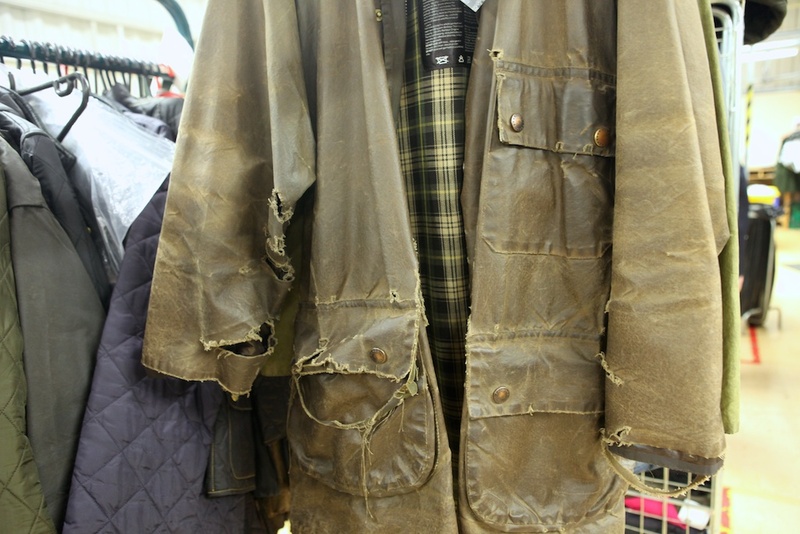 It’s really something how a tatty coat can come back looking so good. Barbour garments are easier to find around where I live in Northern Virginia than Filson. I purchased one of mine in a little shop on Sydney Street in London, just off King’s Road when we were there year before last. The other came from Orvis from an actual store. 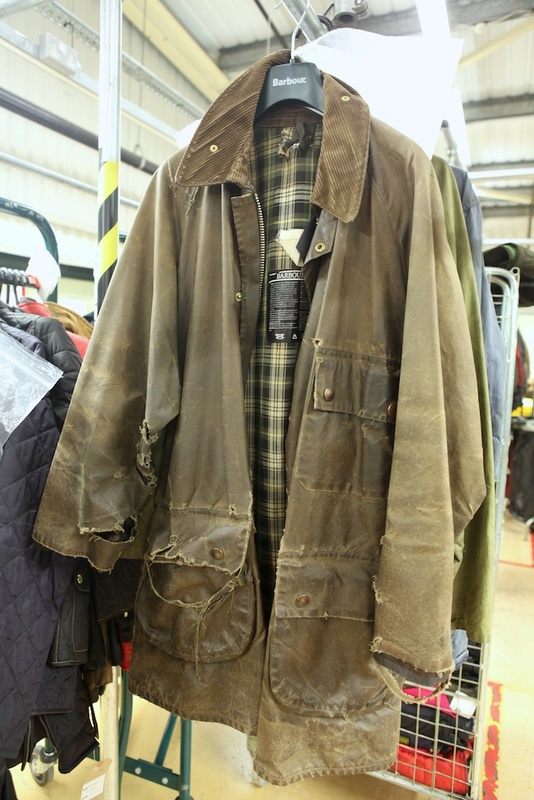 However, my Filson field jacket also has developed an odor but you don’t notice it outside where there are so many other odors, smells and fragrences both fresh and stale. 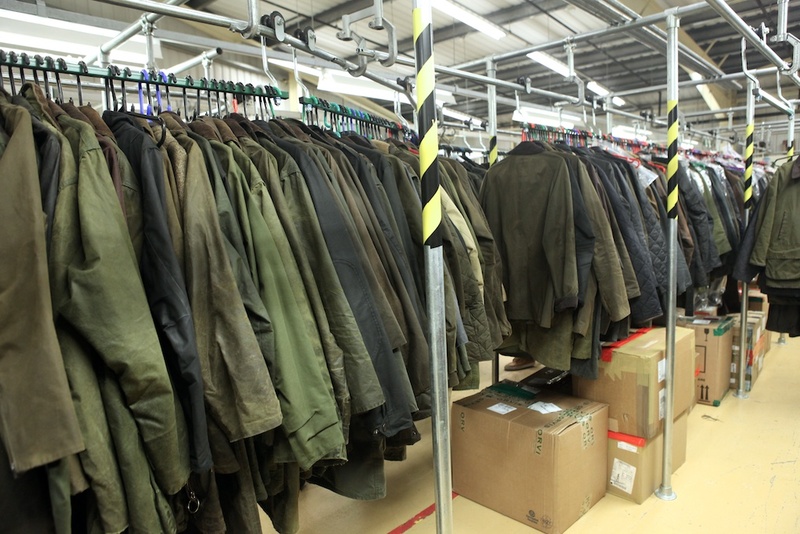 @ Little Red – Last I looked all the men’s coats had logos stitched on. Some of the women’s styles might be logo-free. Great to see the industry is still alive in England! 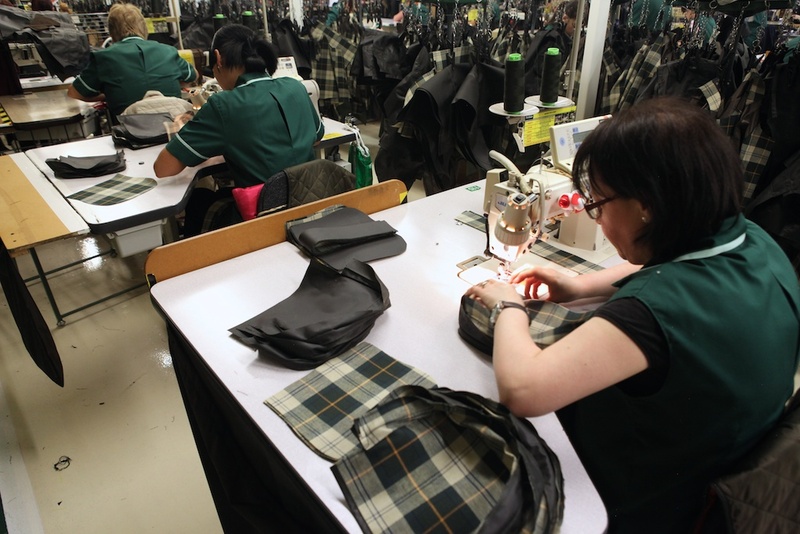 It’s great to find brands that actually produce their own products using their own workers instead of outsourcing overseas (China!) for cheaper labor and quality. I’ll buy something Made in the USA, England, Italy, etc. any day of the week before I support a brand that favors child labor and ridiculously low wages for their employees! 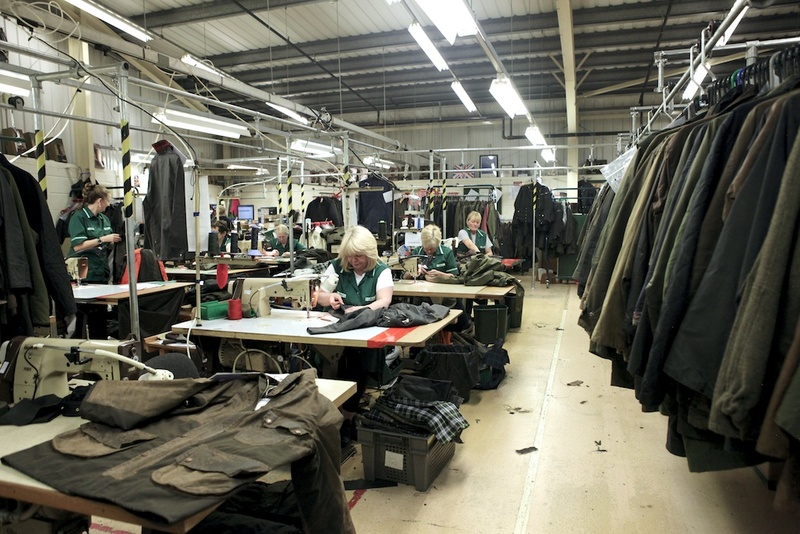 Whats considered the more traditional barbour jacket? Bedale or Beaufort? Thanks!